Oakmont Village in Santa Rosa, California is a 55+ community set in the middle of the beautiful wine country of Sonoma County. This 1,255-acre age-restricted community has a rural feel but is situated only a few miles from downtown Santa Rosa, a modern city with fine dining, shopping, and top-notch healthcare. 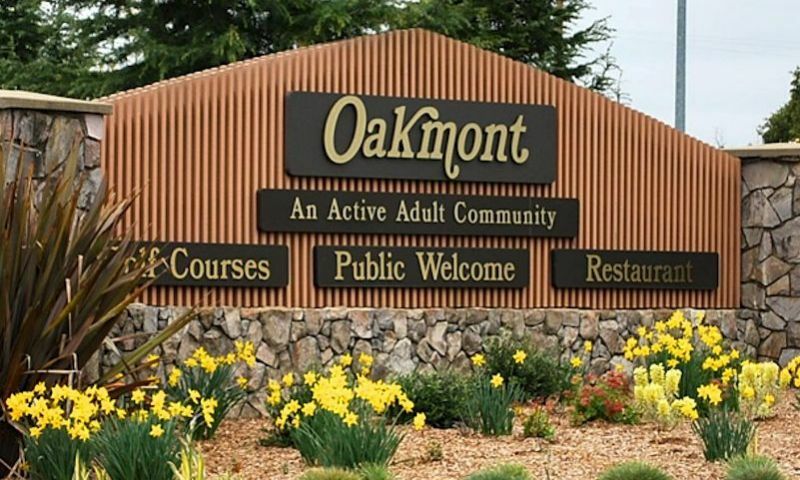 With its 36-holes of golf, three clubhouses each with a pool and outdoor spa, an events auditorium, and many clubs and activities, Oakmont Village provides residents with an active lifestyle set amid the natural beauty of both mountains and vineyards. Homes within the community are diverse and include both single-family and attached homes. For residents who require daily care, the Oakmont Gardens assisted-living apartments are conveniently located within the Oakmont Village community. The two 18-hole golf courses at Oakmont Golf Club are the jewel of Oakmont Village. Located in the scenic Valley of the Moon in the heart of the Northern California wine country, these challenging courses offer majestic mountain views and emerald fairways. The clubhouse at the Oakmont Golf Club contains the popular Quail Inn restaurant and its more casual Bar and Grille. There is even a banquet room, with its large deck and impressive views, that is perfect for hosting private parties and events. Oakmont Village offers three spacious clubhouses: Central Activity Center, West Rec Center and East Rec Center. The Central Activity Center is the main clubhouse where residents can stay both physically and socially active. The state-of-the-art fitness center offers both cardiovascular and strength-training equipment to help residents stay in shape. There is a card and game room, library, computer learning center, and arts and crafts studio. Outside, residents can take a dip in the pool or get competitive in a game of horseshoes, bocce, shuffleboard, or lawn bowling. The West Rec Center has a meeting room, catering kitchen, and table tennis. This facility is commonly used for aerobic classes and club meetings. Outdoors, residents at Oakmont Village can take advantage of four tennis courts, six pickleball courts, three bocce ball courts, a picnic area, and an outdoor salt-water pool and spa. The East Rec Center features a meeting room, billiards room and catering kitchen for socializing with neighbors and friends. The East Rec Center also offers an additional four tennis courts, an outdoor pool and spa with a patio. Oakmont Village also has its live entertainment center in The Berger Center, which contains a large auditorium with a catering kitchen. This venue often hosts a diverse range of concerts, dances, weekend movies, and the annual Rotary Crab Feed. Oakmont Village in Santa Rosa, California offers many styles of homes to accommodate a variety of tastes and preferences. Eighty-percent of the houses are single-family homes while attached homes make up fifteen-percent of the community. The remaining five-percent of residents live in apartments at Oakmont Gardens, the independently-owned assisted living facility located within Oakmont Village. Oakmont Village offers homes in a variety of design styles. The first phase began in the late 1960s and the final phase was completed in 2016. There are over 40 single-family models within Oakmont Village. These options range in size from 941 to 2,749 square feet and offer one to four bedrooms, one to three bedrooms and an attached one to three-car garage. Single-family homes within Oakmont Village are available on a new and resale basis. Oakmont Village also gives residents several attached home options. These options range in size from approximately 980 to over 1,600 square feet of living space and feature one or two bedrooms, one or two bathrooms, and an attached carport. The attached homes within Oakmont Village are also available on a resale-only basis. Spread over 1,255 acres, the homes at Oakmont Village offer a wide choice of views. Some lots provide golf course and majestic mountain views, and other hillside homes allow beautiful views of vineyards and the greenery of the Annadel State Park. Residents who enjoy gardening may prefer to purchase an owner-maintained lot, while those who prefer to leave the landscaping to others may choose a home in a maintained area. Residents at Oakmont Village Santa Rosa enjoy an active lifestyle, both physically and socially. Golf is popular among residents, as is tennis, bocce ball, lawn bowling, billiards, and card games. Oakmont Village residents can also express themselves with interests such as digital photography, arts and crafts, play reading and painting. To meet the needs of all residents, the community offers over 100 social clubs, including the chess club, Cal alumni club, the Democratic and Republican club, Edgar Cayce study group, genealogy club, library volunteers, Oakmont walkers, Red Hat society, and Valley of the Moon Rotary Club. In addition to the many clubs and activities, residents also stay active with volunteering. Though residents volunteer throughout the Santa Rosa area, there are plenty of volunteer opportunities available within the community. The Board of Directors for the Oakmont Village Association and all of its various committees are staffed entirely by volunteers. Founded in 1971, the Oakmont Visual Aids Workshop is a unique volunteer group dedicated to producing Tactile Aids that are donated for use in teaching visually and mentally impaired children throughout the world. The Sonoma County wine country is known for its wonderful climate and natural beauty. Set in the beautiful Valley of the Moon of Sonoma County, Oakmont Village in Santa Rosa has a rural feel but is minutes away from the shopping, dining, and cultural attractions available in Santa Rosa. Many excellent restaurants, farms and wineries surround the community, and the two adjacent state parks ensure that Oakmont Village will retain its natural, rural setting. Oakmont Village is located approximately one hour north of San Francisco and seven miles east of downtown Santa Rosa. The Pacific Ocean is 30 miles to the west and the great redwood forests are only a short drive away. For added convenience, a circulator bus offers residents free transportation to local shopping and entertainment areas. Some popular attractions in the area include Charles M. Schulz Museum and Research Center, Luther Burbank Home and Gardens, Sonoma County Museum, Howarth \Park’s Lake Ralphine, and Historic Railroad Square. With its rural beauty and convenient proximity to commercial needs, active adults who choose Oakmont Village in Santa Rosa, California enjoy the best of two worlds. The jewel of the activities centers is the new Central Activity Center. Here, residents can stay physically and socially active with a selection of indoor and outdoor amenities. The West Rec Center is mostly used for aerobics classes and club meetings. The East Recreation Center is a great place for banquets and parties. Here, residents can watch movies, attend club meetings and host activities. The Berger Center is the largest auditorium and is used for concerts, dances, movies, lifelong learning classes and the annual Rotary Crab Feed. Oakmont Golf Club has is own association fees to be a member but residents of Oakmont Village receive reduced green fees. There are plenty of activities available in Oakmont Village. Here is a sample of some of the clubs, activities and classes offered here. The Orchard at Oakmont patio homes were built by Willowglen Homes and are attached residences in Oakmont Village. Available on a resale basis, these thoughtful designs range from 1,430 to 1,671 square feet. Most homes feature two bedrooms, two bathrooms and a one or two-car garage. The Orchard at Oakmont single-family homes are offered in seven floor plans. Developed by Willowglen Homes, these units are available on a resale basis. This neighborhood offers all of the latest designs and sought after features craved by today's active adult buyers. Homes range in size from 1,919 to 2,393 square feet and feature two to four bedrooms, two or two-and-a-half bathrooms and a two to three-car garage. Construction began on these attached homes in 1967 and many different types of homes and models are now offered on a resale-only basis. Homebuyers can choose from single-level homes arranged in quads, triplexes and duplexes. These homes range in size from 980 to 1,541 square feet and feature one or two bedrooms, one or two bathrooms, and a one or two-car garage. Association fees vary depending on the neighborhood, but most typically include exterior building maintenance and lawncare. There are many choices for single-family homes in Oakmont Village. Whether you prefer a cozy cottage or a stately hillside estate, the choices are endless. Most homes are single level and offer a wide variety of models and styles built over a 30-year span. Homes have 941 to 2,749 square feet and feature one to four bedrooms, one to three bathrooms, and a one to three-car garage. The Meadows is the final phase of Oakmont Village and consists of single family homes developed by Willowglen. These homes range in size from 1,200 to nearly 2,500 square feet and offer two or three bedrooms, two to three bathrooms, and an attached two or two-and-a-half-car garage. Love this neighborhood. So much to do with the golf courses and vineyards nearby! I discovered Oakmont by accident before I was about to make an offer on a residence elsewhere. It was truly serendipity. I love it here......it's impossible not to love it here. This is an ideal community for people to move to who live close or from far away. There are so many things to do: sports, clubs to join, music to hear, talks and lectures to attend, a library, computer and art rooms, and people to meet, as well as all the beautiful surroundings of nature, parks, wineries, mountains. Not far away are world renowned restaurants, concert halls, and international cinemas. It is hard to be bored. Inside the community there is a business area including banks, exercise and medical facilities, beauty parlors, village market, and restaurants. There are even city buses which drive around the community and into Santa Rosa, and another which drives through the Oakmont community and on to the cities of Sonoma or Santa Rosa. We are truly lucky to live here. 55places.com is not affiliated with the developer(s) or homeowners association of Oakmont Village. The information you submit is distributed to a 55places.com Partner Agent, who is a licensed real estate agent. The information regarding Oakmont Village has not been verified or approved by the developer or homeowners association. Please verify all information prior to purchasing. 55places.com is not responsible for any errors regarding the information displayed on this website.